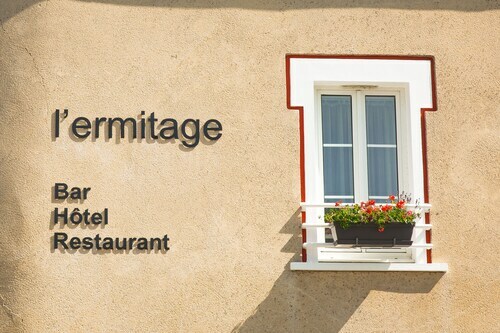 Situated in the historical district, this hotel is 0.1 mi (0.1 km) from Eglise Saint-Pierre de Saulges and within 3 mi (5 km) of Caves of Saulges and Chateau de Thevalles. Claude Chappe Museum and Lake Brulon are also within 12 mi (20 km). Pet lovers shouldn't miss the chance to visit Saulges, a quaint city known for its monuments and restaurants, as well as attractions like Eglise Saint-Pierre de Saulges and Chateau de Thevalles. Enjoy top attractions like Caves of Saulges, Claude Chappe Museum, and Church of St Peter - St Paul. Other things to see include Lake Brulon, St Peter's Abbey of Solesmes, and Abbey of St Cecile. For vet care, Clinique Veterinaire Du Fresne, Artemis Veterinary Clinic, and clinique equine de meslay are located in the area. Pets are allowed for a fee at this 3-star hotel. Guests appreciate the restaurant and WiFi. Weather can make or break your trip, especially if you want to spend time outdoors. We have gathered the average daytime and nighttime temperatures to help better plan your time in Saulges. From January to March, average temperatures range from 56°F in the daytime to 37°F at night. Between April and June, the daytime average is 72°F and the nighttime average is 41°F. From July to September, average temperatures range from 76°F in the daytime to 51°F at night. Between October and December, the daytime average is 66°F and the nighttime average is 38°F.